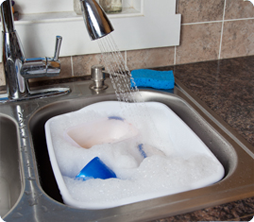 The 12 Quart Dishpan is ideal for a variety of basic household needs and is designed to fit inside of a standard twin-sized sink. It is easy to clean and allows you to expand your sink space with more washing and soaking room in the kitchen. 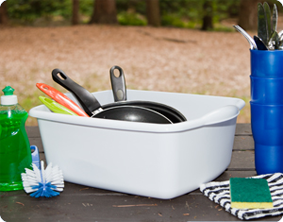 It's durable, heavy-duty construction makes this dishpan ideal for everyday household tasks. Two handles are molded into the side for comfortable and easy lifting and transporting of items. The plastic, non-porous container is useful for many tasks such as soaking dishes, washing small toys, cleaning delicate clothing and storing items in a cabinet or pantry. The overall dimensions of this item are 15 3/4" L x 12 1/2" W x 6" H.
Overall Assembled Size: 15 3/4" x 12 1/2" x 6"
Perfect for use in a standard twin-sized sink. 12 Quart Dishpan is rated 3.3 out of 5 by 10. Rated 5 out of 5 by Tray from Bring Back The Black 12qt. Dishpan I need the black 12qt to match my other Black Sterilite sink products ! Please bring back the black 12 qt. dishpan and watch your profits rise again ! The people public wants this color back ! Rated 5 out of 5 by adoxa from Best Quality Have been buying these dishpans for years, after wasting money on dollar store quality. The Sterilite brand is the best of what I have been able to find, and it fits in my sink, important. Too bad that my previous one split right at the top edge, first time that it happened. Maybe a bad batch or whatever. Just bought a new one, still like them hoping this one does not split at the rim. Rated 2 out of 5 by Maudd from Not sturdy Handles cracked after a few months. And you no longer make the black! Rated 4 out of 5 by KD from Where's the Black? I use this dish pan as cubbies for my preschoolers. I like the size for this purpose as it can hold a few sets of extra clothes, an extra pair of slippers, their blanket and jacket. I need to have matching cubbies and I can't find the black in the 12 qt. size anymore. Please bring that back. Please. And if you could be so kind as to let me know when they will be available I will purchase another 6 from you right away. Mahalo! Rated 5 out of 5 by Ed Meyers from Dishpans I use both sized dishpans to catch snow and ice melting off of my cars in the winter, I place four on each side, front and behind both wheels on each side, it is amazing how much you can save from running onto the garage floor. Rated 4 out of 5 by Monadnock 71 from BRightens dishwashing Red brightens my day. Washing dishes can be mundane so I look for simple pleasures like color to make mundane enjoyable. 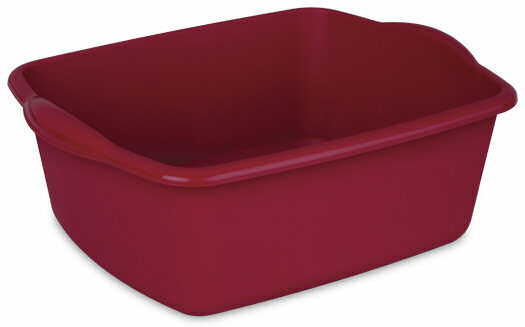 This is my second red dishpan from Sterilite - each one lasted several years. The rim of my current dishpan seemed to break on the edge that I grad to empty the pan, which did not happen with the earlier one. I will be buying my third this weekend. Rated 5 out of 5 by Ron333 from Low Cost Dish Pan For a buck 88, you can't beat it. I would like it to be about an inch shorter, but still works well. Heavy use for over a month with no problems.